There were just a few days left before Christmas and no time to waste. Up at the North Pole, everyone was busy. Elves, all the reindeer, Santa, Mrs. Santa, and the Christmas Cottontail and his under bunnies were running hither and yon from toy workshop to stables to kitchens to greenhouses and in and out of Santa's office where Santa sat checking and re-checking his lists. But there was always time for lunch, so at the noon hour, everyone stopped for a bite to eat. 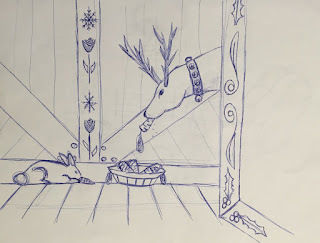 The Christmas Cottontail, whom everyone now called CeCe, and one of the reindeer shared a bowl of carrots. "Hey, Cece," said the reindeer, "how are your preparations going for Christmas?" "They are going quite well," answered Cece. "I just wish more people knew about me." "Oh, having a bit of an identity crisis, are we, because Santa and his elves get all the glory?" "Something like that," replied Cece. "Maybe I can help. Tell me again how you came to be the Christmas Cottontail." Cece was happy to oblige because he loved to tell his story. So as he and the reindeer munched on green bean cookies, a favorite after lunch treat, and sipped hot cloverberry tea, the Christmas Cottontail told his story once again. "It was on Christmas Eve when it all started, a long time ago. I was a young bunny, all alone, cold, hungry, and shivering in the snow when I heard Santa's sleigh bells. He landed his sleigh a few feet from me and just as he came to stop, missing me by a mere few inches, I spied some carrots left out for his reindeer. I'm not a thief but I was so hungry I decided to take a bite or two from the carrots. Just then Santa came by and scooped me up into his big mittens. I was frightened, but he whispered to me to not be afraid and set me gently down on the seat of his sleigh and covered me with a warm blanket. I spent the rest of that Christmas Eve riding around with Santa and eating my fill of carrots. I had to hang on for dear life as we went from house to house. Santa moves fast! When we got back to the North Pole, Santa handed me off to some of the elves, who cleaned me up and took good care of me. I ate and rested for quite a while until I had my strength back. I also grew bigger and stronger. When Spring came, Santa called me into his office and explained to me that no one gets to stay at the North Pole without a job so after some discussion about my skills and talents, he decided that I would fly with him every Christmas Eve to plant bulbs and scatter flower seeds in all the good gardener's gardens. When we came to a bad gardener's garden, I could just sit in the sleigh and enjoy the carrots. I was thrilled and delighted with my assignment and spent all that spring, summer, and fall with Santa's elves and garden fairies learning how to plant bulbs and scatter seeds faster than you would ever believe because trust me, when you fly with Santa there is no time to waste in each garden. You gotta be quick!" "I never tire of hearing that story," said the reindeer, "but why do you have an identity crisis, Cece?" "Because no one knows who I am!" "Oh," said the reindeer, "maybe you need a signature red nose, like Rudolph?" "Well, you could wear all green and threaten to steal Christmas like the Grinch." "Why would I do that? I love Christmas and I look forward every year to riding with Santa and visiting gardens!" "Hmmm... maybe you could melt every year and come back each year, like Frosty the Snowman?" "That doesn't sound like fun at all!" 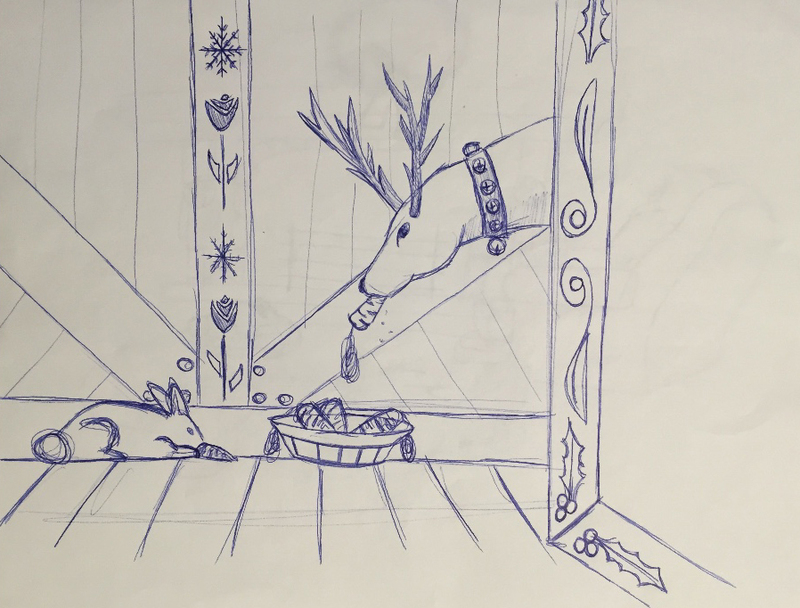 And so they sat and pondered, the Christmas Cottontail and the reindeer, about how to spread the word of the little bunny who rides with Santa on Christmas Eve scattering seeds and planting bulbs in the gardens of good gardeners everywhere. They decided then that what the Christmas Cottontail needed was more publicity and so they agreed to make a New Year's resolution for the coming year to do all they could to teach gardeners everywhere, both good and bad, about the Christmas Cottontail and how he rides with Santa every year. And then they got back to work. The first time we have heard of Cece in a long time. Good to read. Cece's story is a heartwarming one ... I will pass it on! I have never seen Santa, but I think maybe, perhaps I have caught a glimpse of CeCe, but I did not know his name until now! I hope to find some unknown flowers in my garden this year! Loved it! I will definitely read it to my granddaughters! You are so talented, Carol! Merry Christmas! How does CeCe plant bulbs when there's snow on the ground and the ground is frozen? Delightful to read another Christmas critter story. Refreshing. Gail, are you the author?